While the choice of vegetable sides and casseroles for Thanksgiving dinner are endless, one mainstay dish that is often brought by guests to Thanksgiving dinner is green bean casserole. Perhaps the popularity in this dish lies in the fact that, after enduring some travel to the family- or friend-designated Thanksgiving dinner home, green bean casserole can be quickly reheated without tasting as though the casserole was reheated. Place the fresh green beans or frozen cut green beans in a (1 1/2 - 2 qt) microwave safe casserole dish. Pour just enough water into the casserole dish to cover the green beans. Cook in the microwave until the water comes to a boil. Drain in a colander. 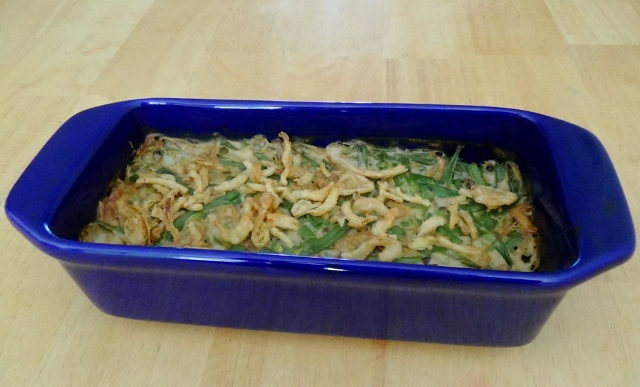 Return green beans to casserole dish. Pour in the can of Cream of Mushroom soup and 1/2 cup milk. Place back in the microwave and cook for 3 minutes. Add 1/2 cup french fried onions. Bake at 375 degrees until casserole bubbles. Remove from oven when bubbling. Place 1/2 cup french fried onions on top of casserole. Return casserole to oven and bake for 3 minutes to golden onion topping.